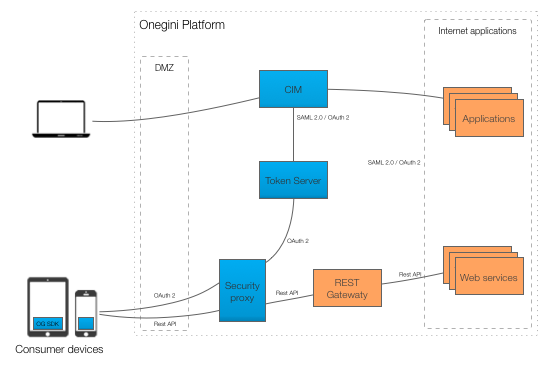 The Onegini Token Server is a complete solution for managing your customer’s authorizations. It provides a comprehensive security Token Server that integrates with enterprise identity and access management systems based on the latest Web and API security standards such as OAuth 2.0. With the Token Server, companies and users can interact by securely sharing data between applications and allow users to approve applications to act on their behalf without sharing passwords. OAuth 2.0 is lightweight and provides universal access for web, mobile app or any other third party application. Unfortunately, OAuth can also be complex to set up, given the number of actors, token formats, transports, management, logging and security mechanisms required. Especially handling all the user interactions requires a flexible architecture since the number of devices is growing rapidly. Luckily Onegini is here to help you out. Token Server Admin: a web application to configure the Token Server, check its statistics and the activity of its clients and users. Token Server Engine: the heart of the Token Server. All the interactions with clients and external components are performed in this application. Installation section guides you through the steps to install the Token Server and provides you with the prerequisites and other necessary things you need to know to get started with the Token Server. Topic guides discuss key topics and concepts at a fairly a fairly high level and provide useful background information and explanation. Reference guides contain technical reference for APIs and other aspects of the Token Server internals. They describe how it works and how to use it but assume that you have a basic understanding of key concepts.